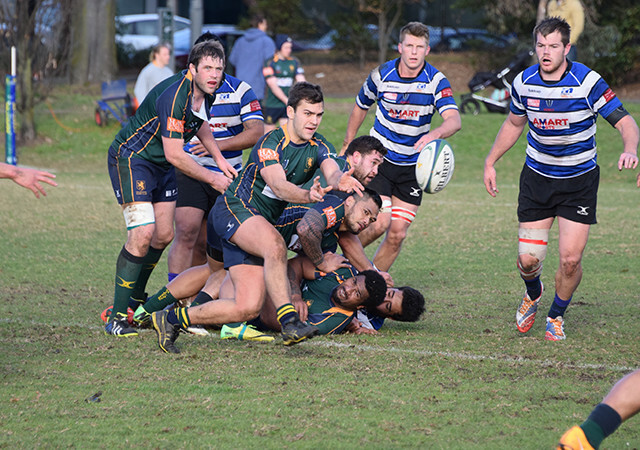 In the Round 13 Direct Connect #DewarShield Match of the Round, Melbourne Unicorns’ unbeaten run came to an end as they were handed a swift reality check from Melbourne Uni in a hard fought encounter at Romanis Reserve. With the competition increasingly even and none of the top four sides able to take a complete stranglehold, the stakes were as a big as the crowd that watched on. The two sides tentatively worked their way into the match, playing cat and mouse for the first ten minutes with no real claims for points made. Eventually, Unicorns fullback Tuafale Meni got the scoreboard rolling with a penalty and the Unicorns went close to the try line more than once in the minutes following, but against the run of play Melbourne Uni winger Josh Cocker-Valu found the paint at the other end after an incisive break. Cocker-Valu didn’t have long to catch his breath either, scoring a second try shortly afterwards as Uni gained control of things midway through the first half. Melbourne kept in touch with a second penalty from Meni, however the potential repercussions of this game were evident as both sides found offensive yards precious, with each attempt going forward met with a ferocious wall of defenders. Uni led 10-6 going into half time, despite trailing 10-1 on the penalty count. Seemingly unfazed however, Uni picked up where they left off in the second as scrumhalf Jack Jenkins extended their lead after getting on the end of his own clever box kick which was gathered by Cocker-Valu. When Junior Nu’u followed suit with one of his own to extend the gap to 20-6, the only thing keeping Unicorns in the contest was inaccurate conversion attempts by the visitors. The home side went into overdrive and willed themselves deep into offensive territory, and finally centre Lucky Mulipola provided them with a much-needed try, Meni converting to reduce the deficit to seven points despite being out-scored four tries to one. Heading into the final ten minutes the Unicorns had belief that they could work their way back into the match, but that hope was quickly snatched away by Uni flanker Sam Bindon who iced proceedings with the Students’ fifth try, this one finally converted to make it 27-13. As the last few minutes ticked over Melbourne continued to fight their way forward but Uni, as they’d shown for much of the day, had all the answers. The visitors walked away fourteen point winners and continue to build a name for themselves as one of the competitions strongest forces.